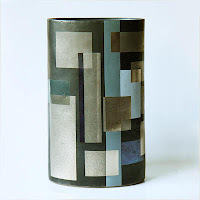 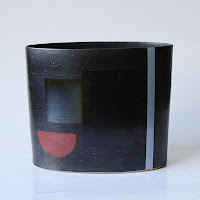 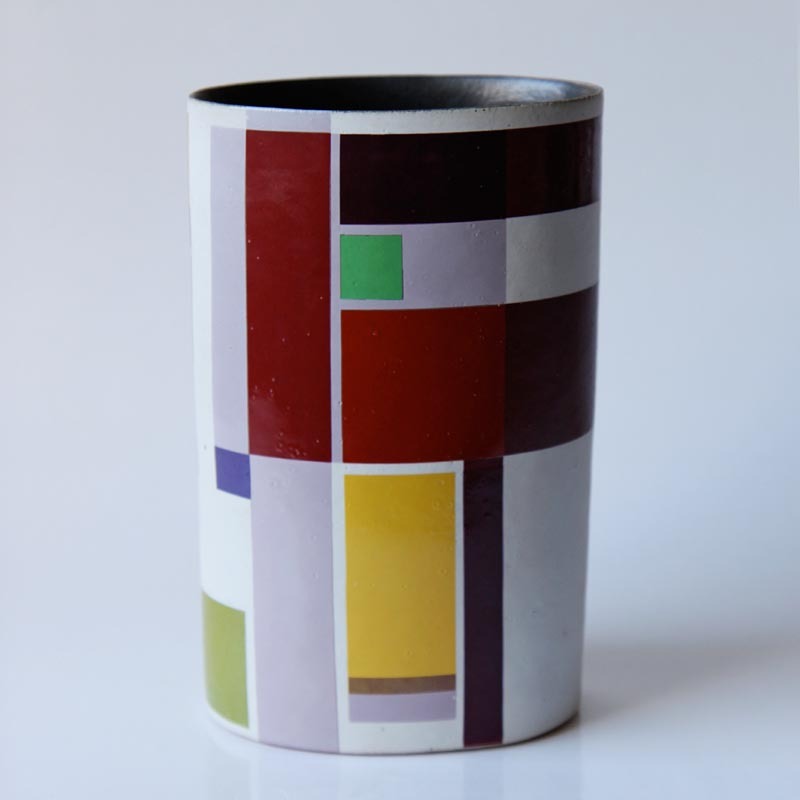 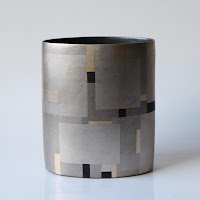 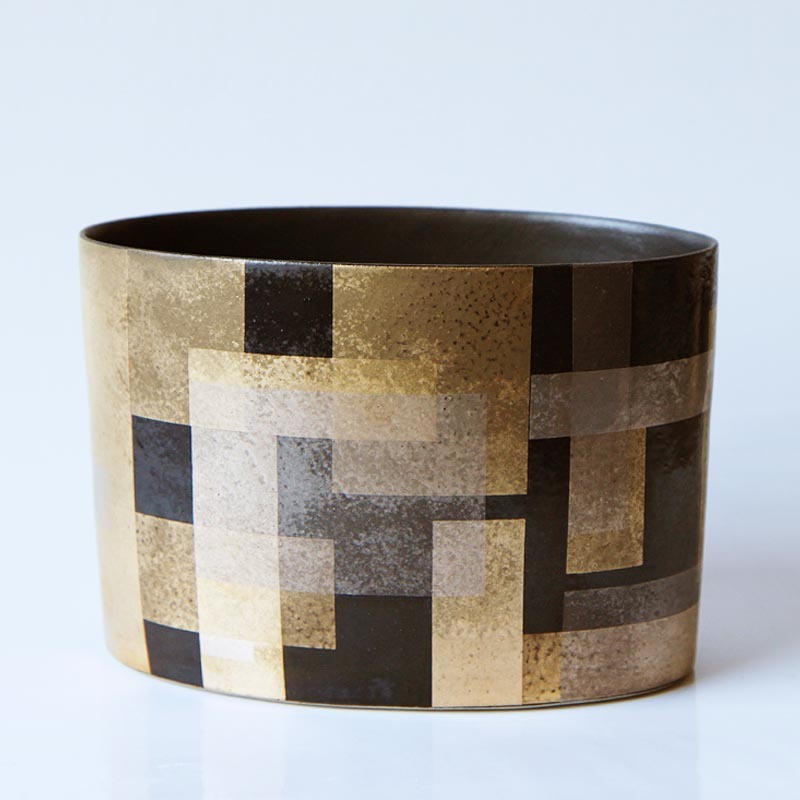 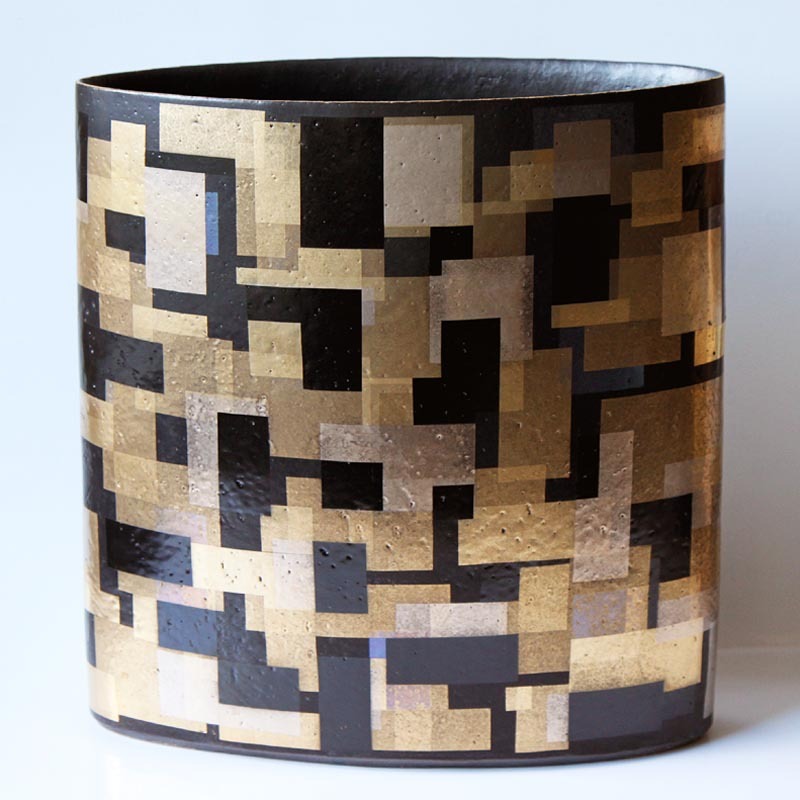 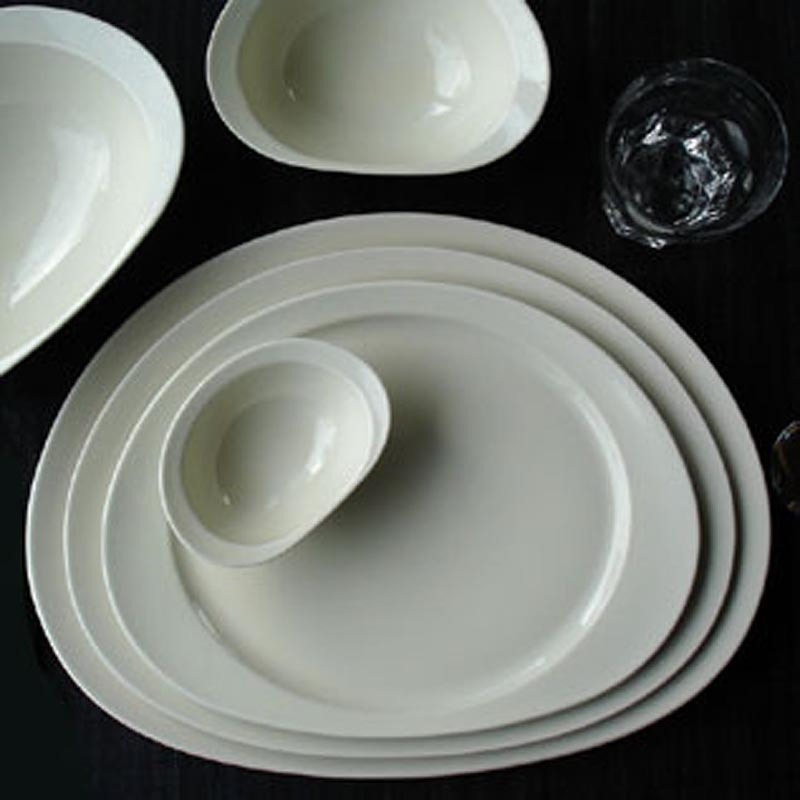 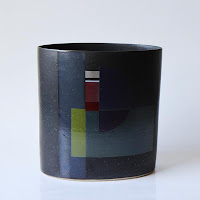 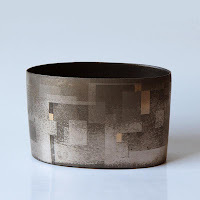 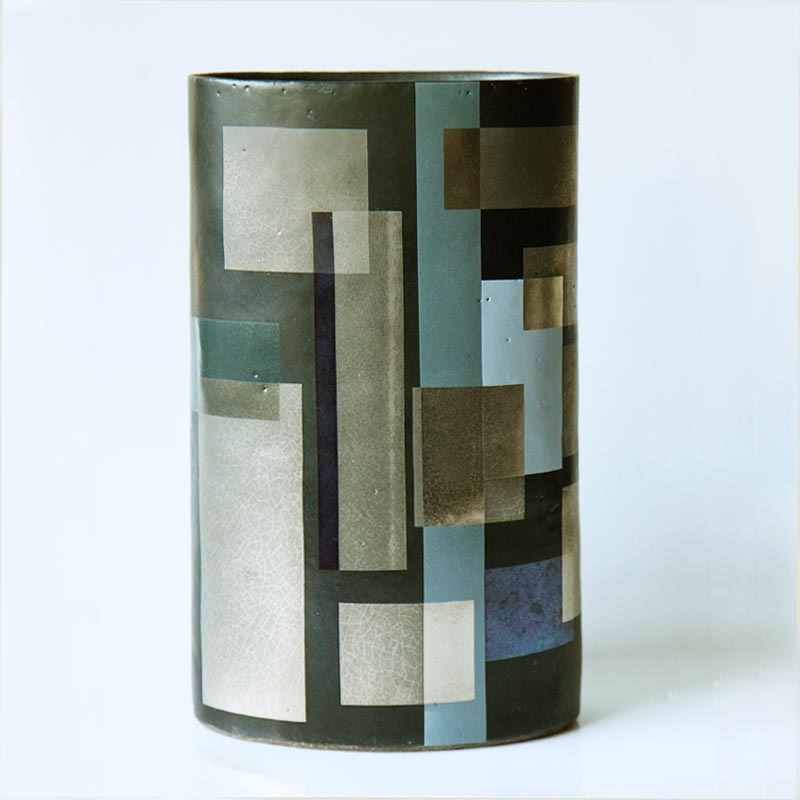 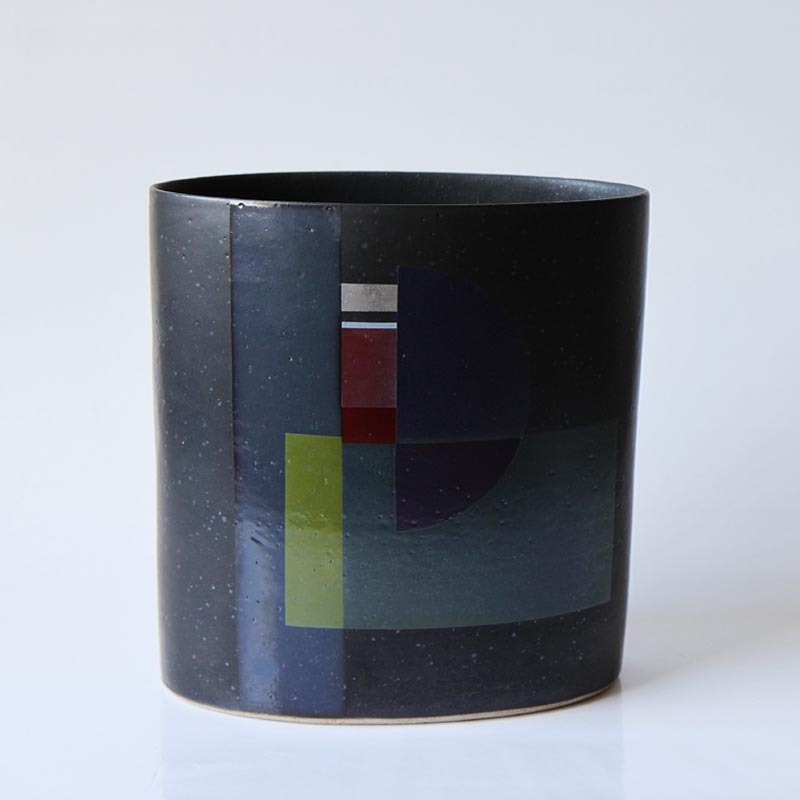 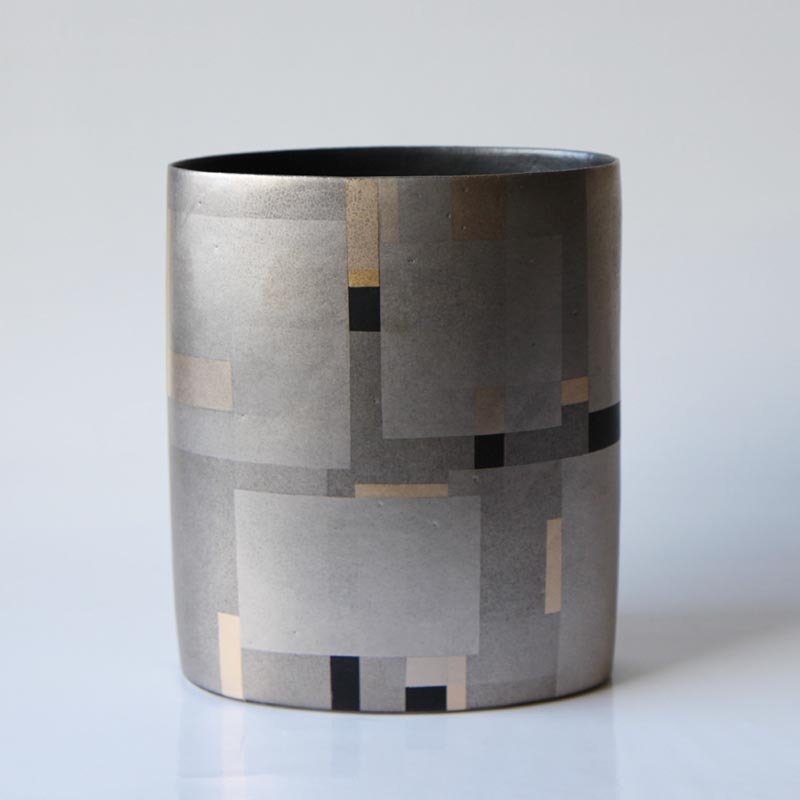 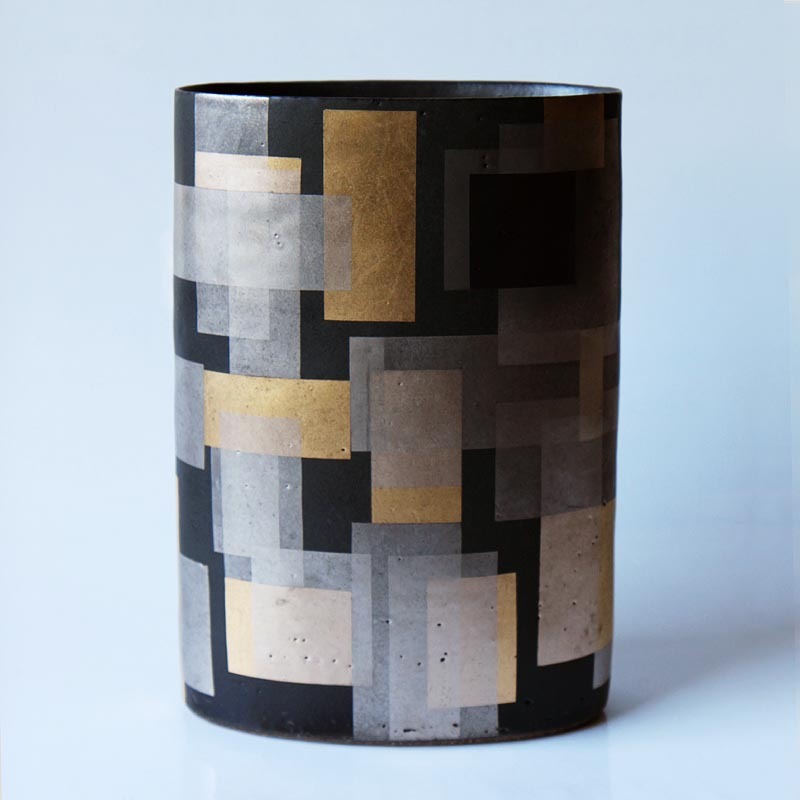 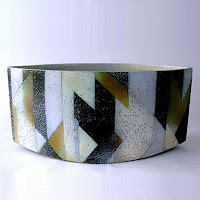 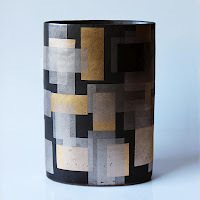 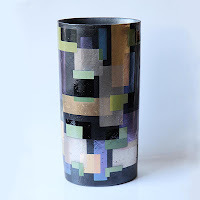 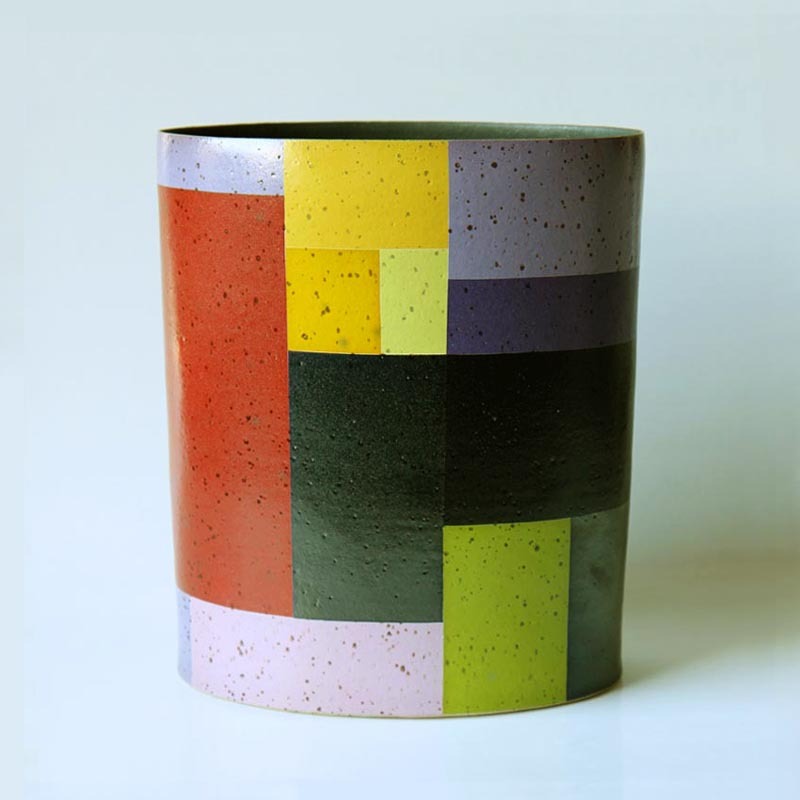 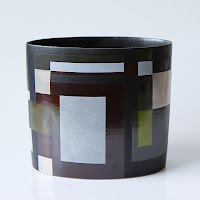 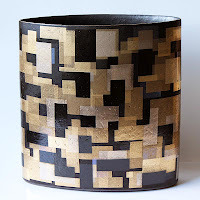 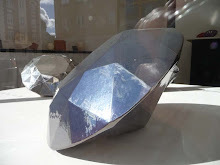 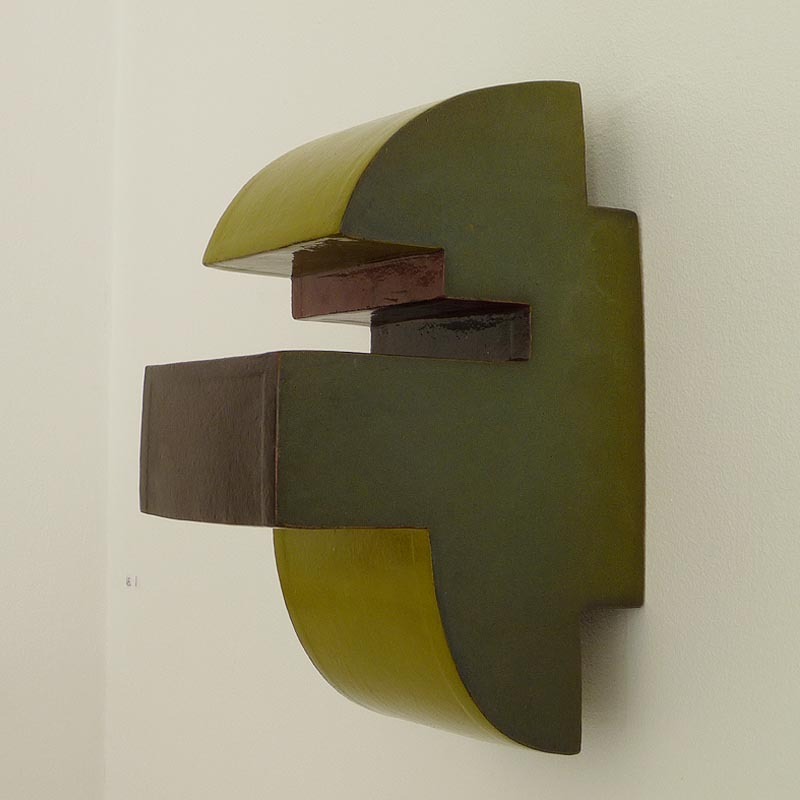 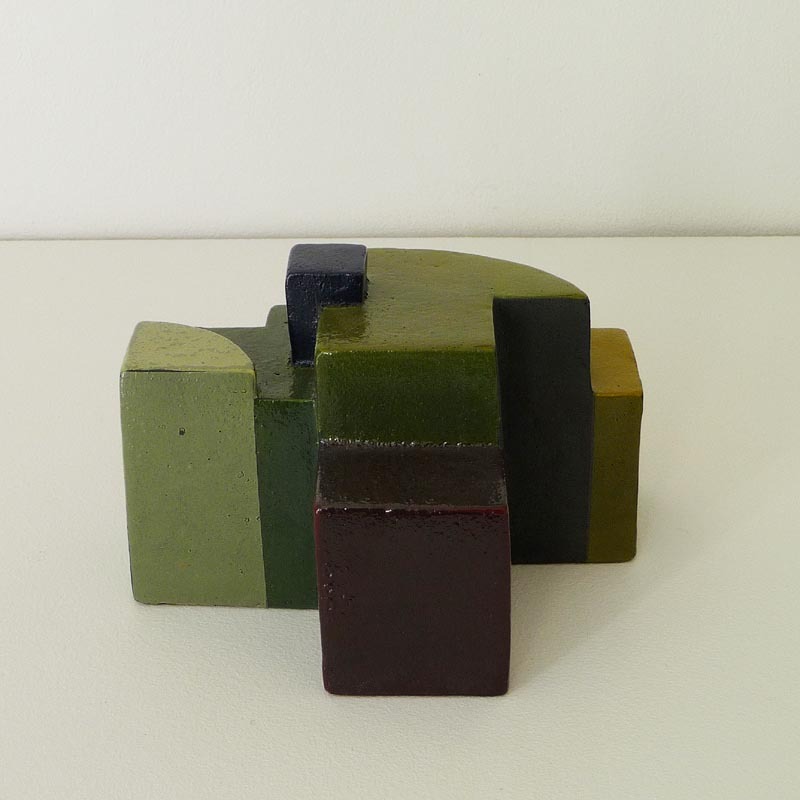 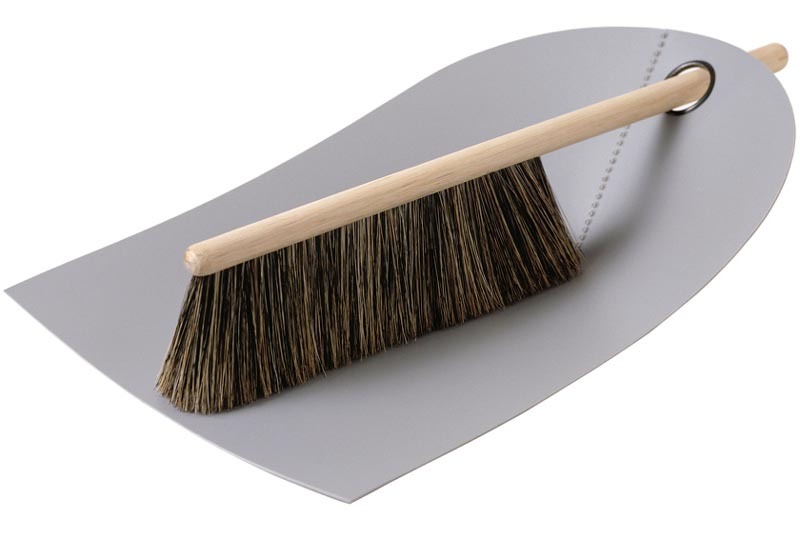 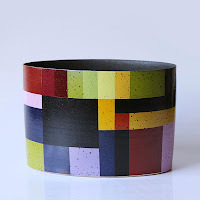 Constructivist avant-garde in ceramic form and surface. 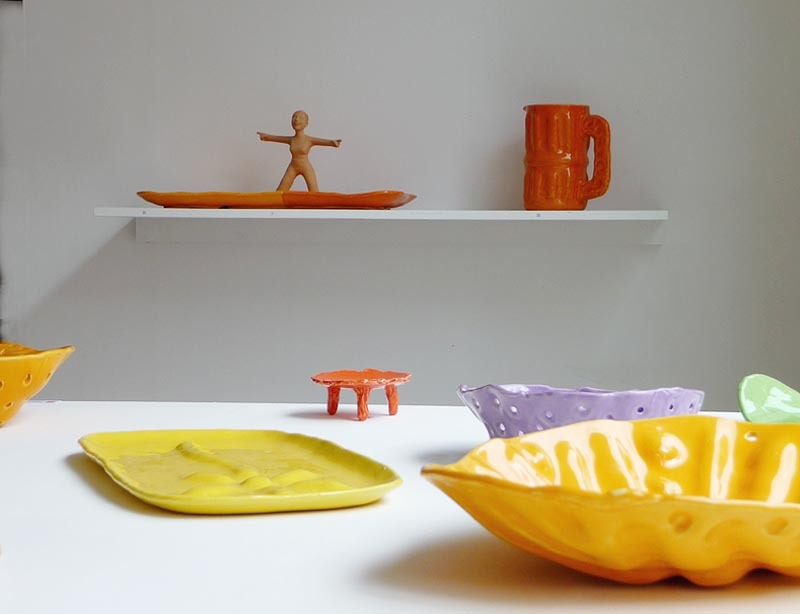 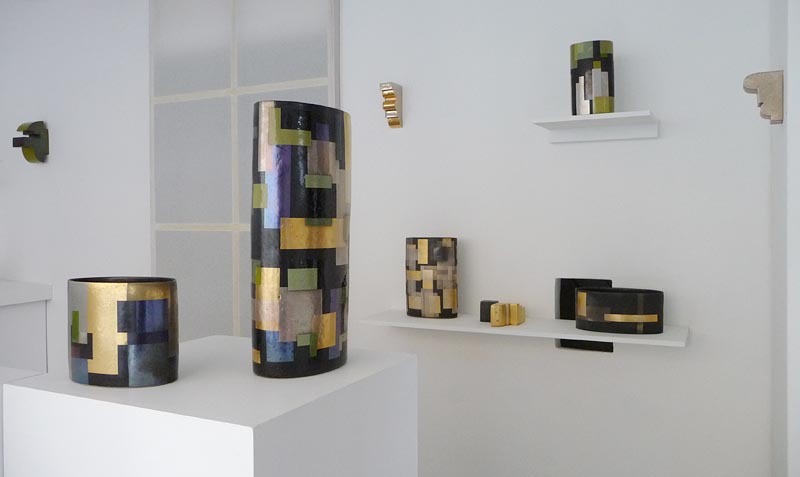 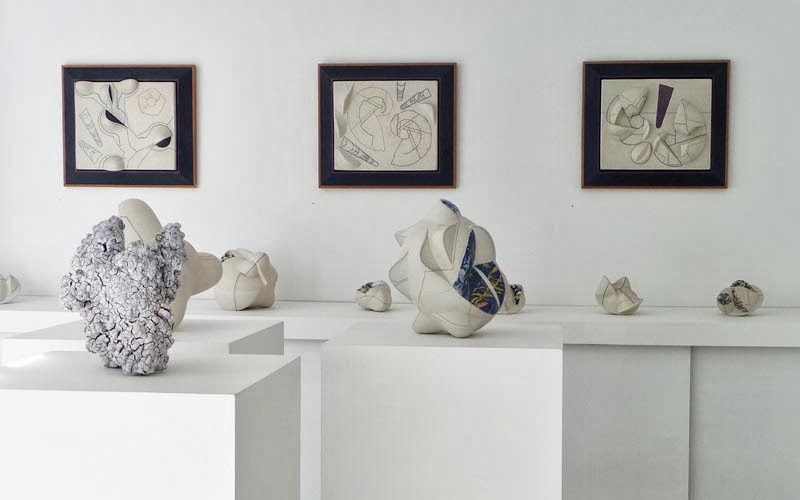 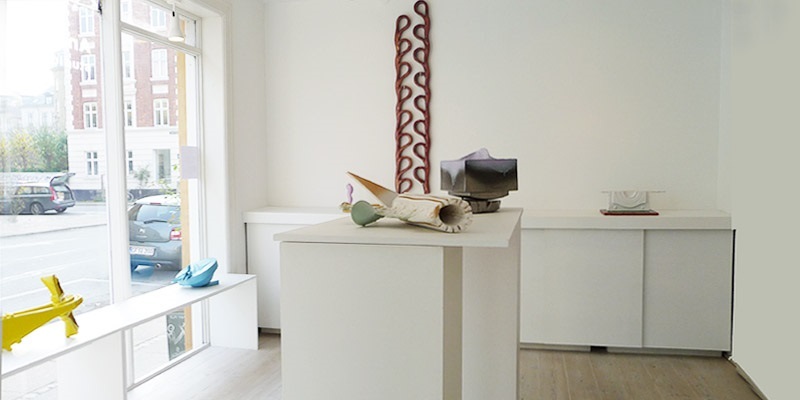 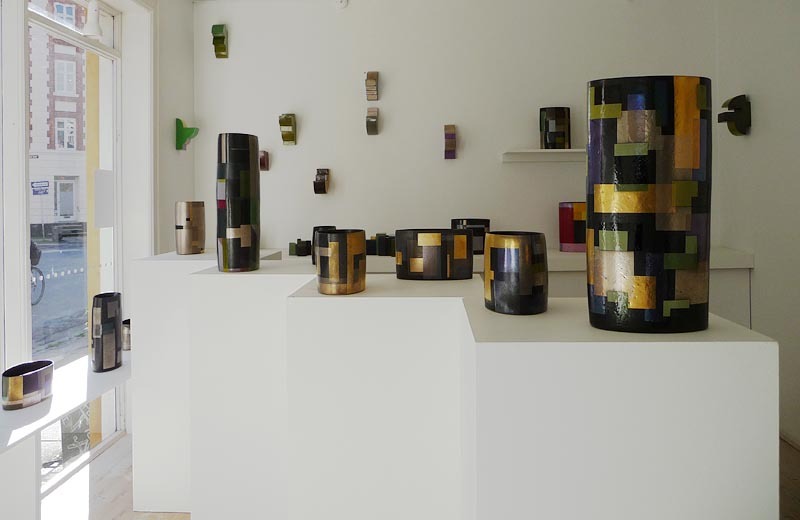 The acknowledged Danish ceramic artist Bente Hansen exhibits new work – from geometric assembled sculpture and wall objects, fragments of stucco to energetic colourful decoration on vessel form. 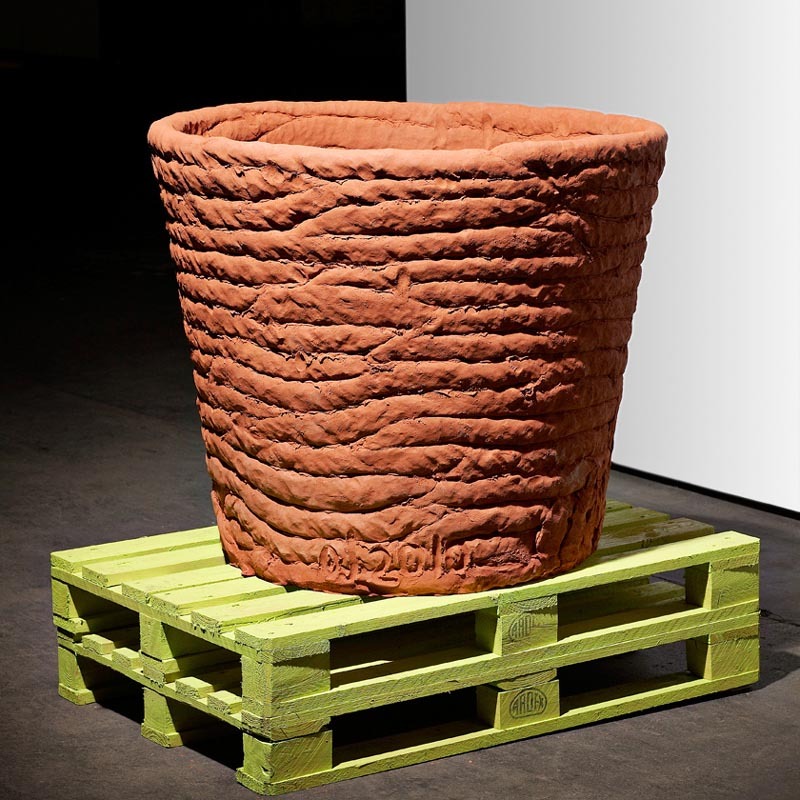 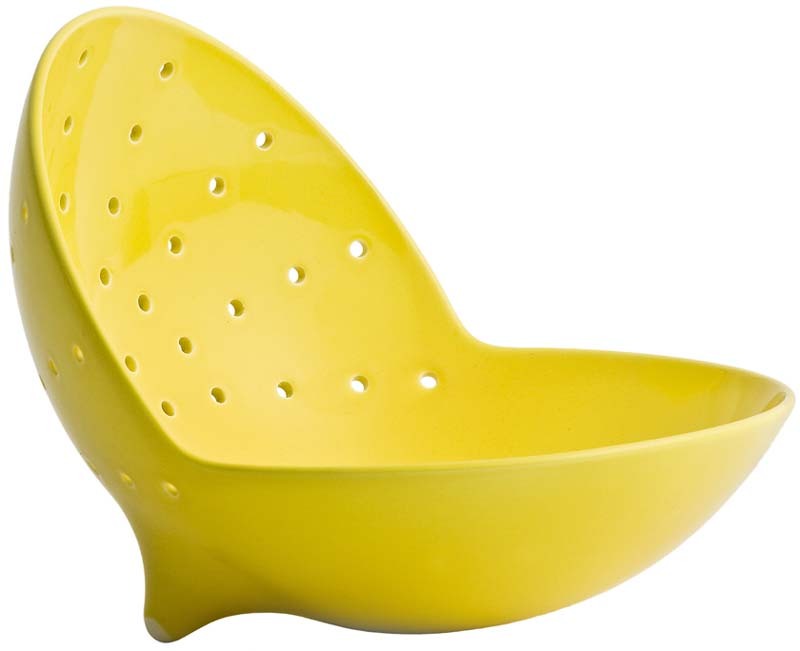 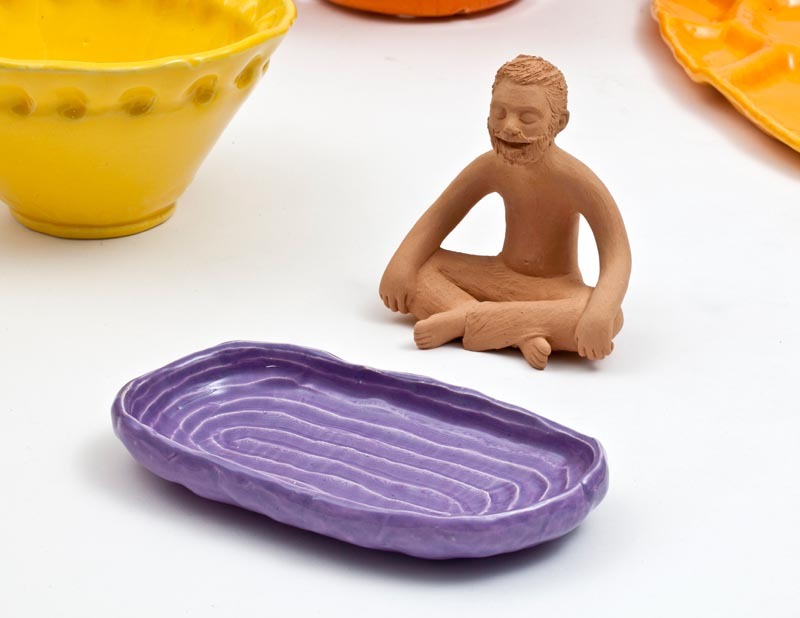 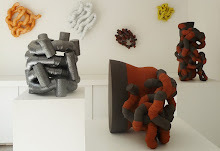 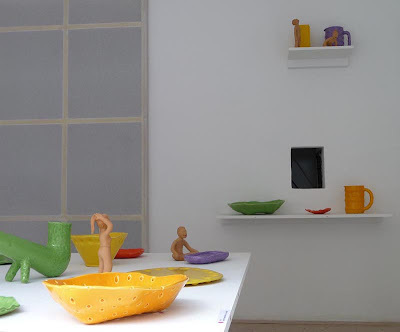 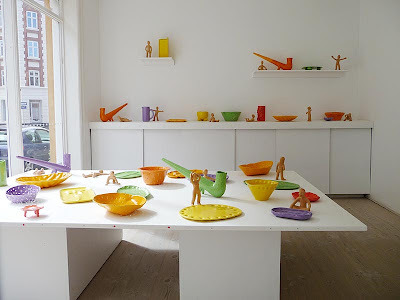 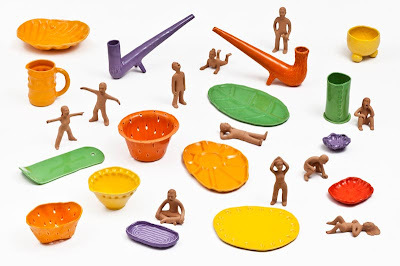 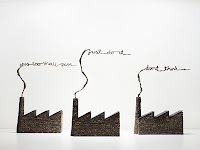 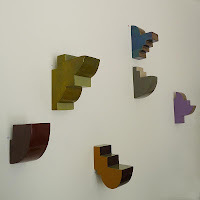 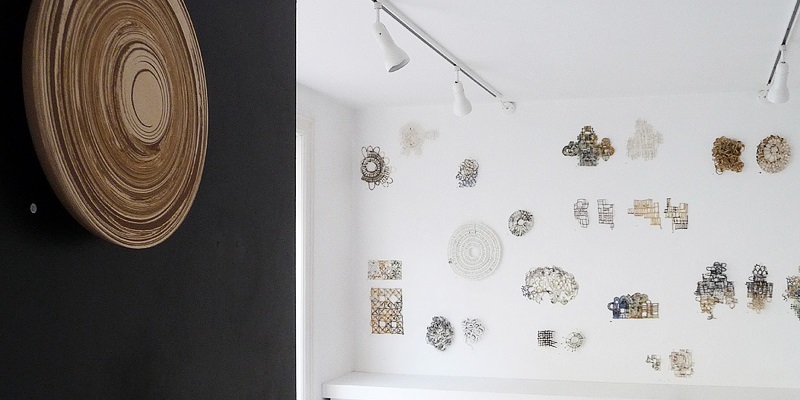 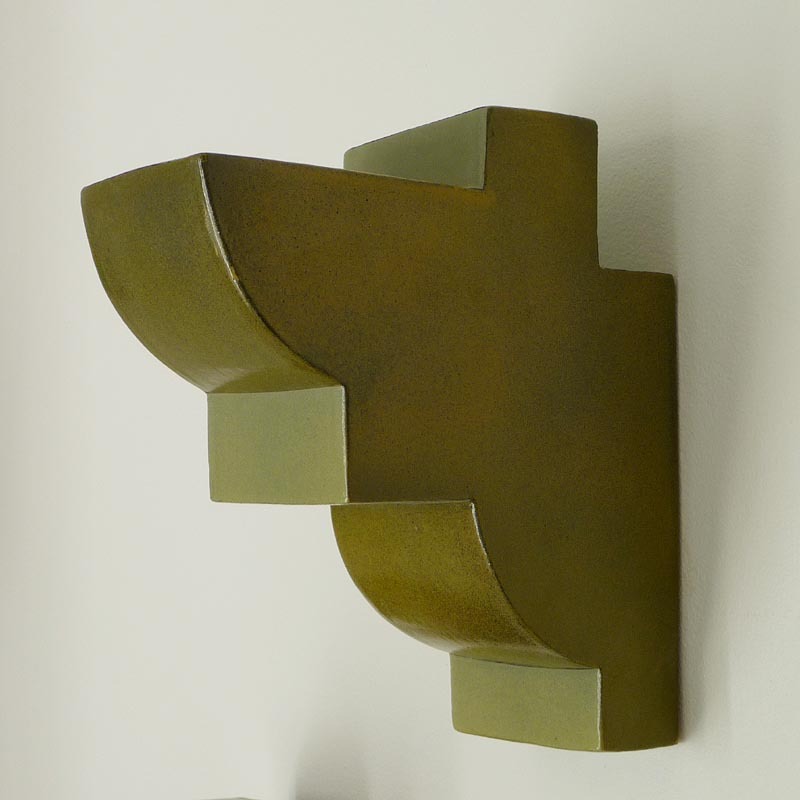 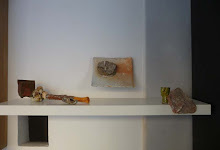 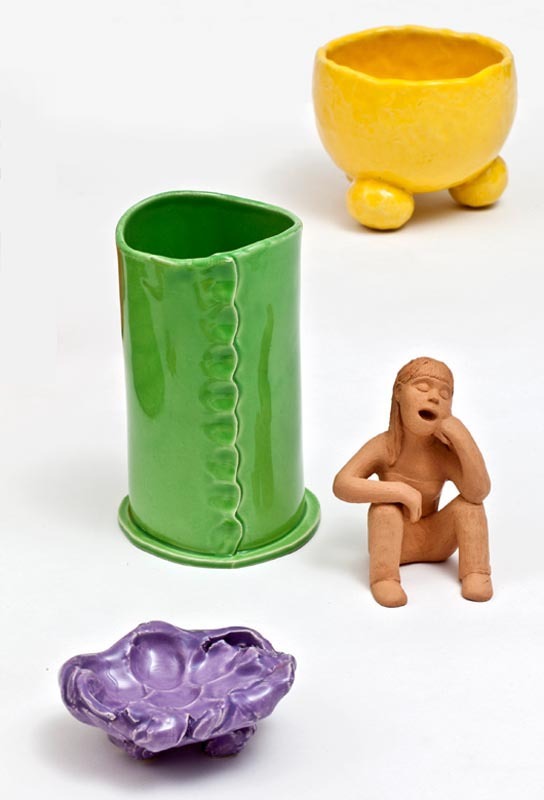 Wall objects, geometric sculptures and vessels are either modelled or wheel-thrown and altered. 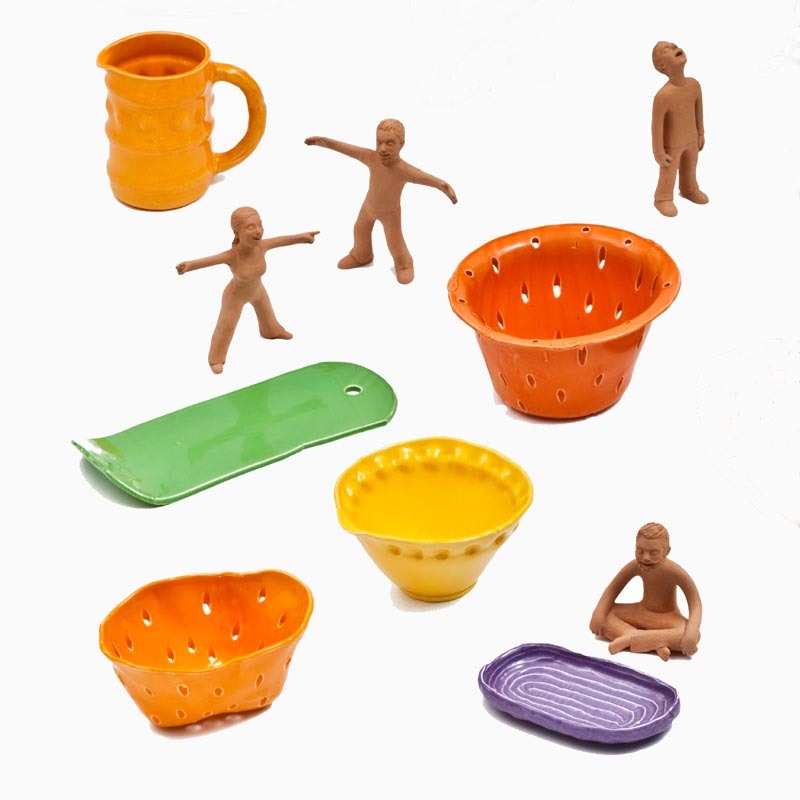 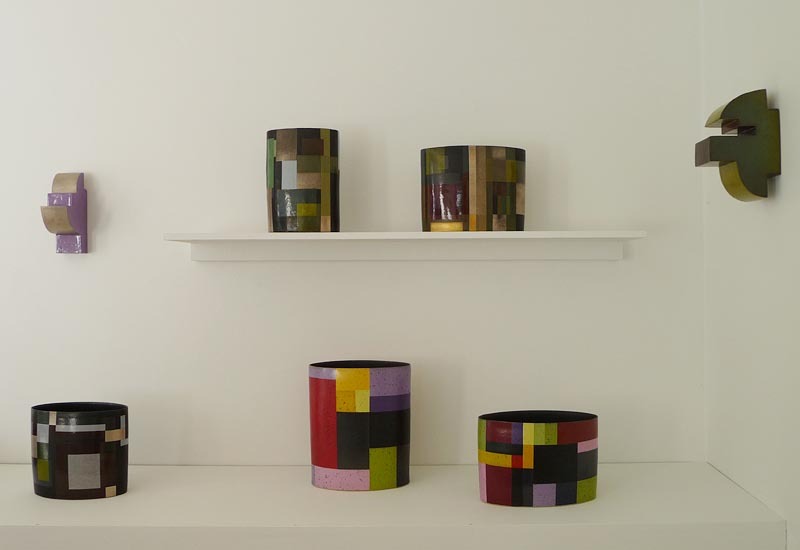 They are colourfully glazed, and in a balance of form and expression, they are transformed in an everlasting investigation process. 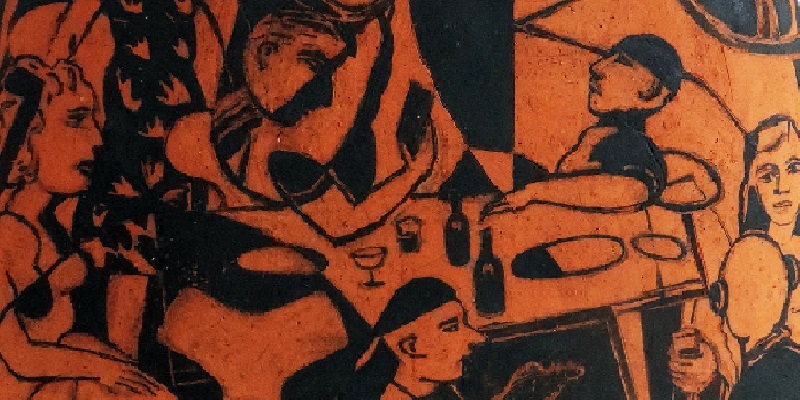 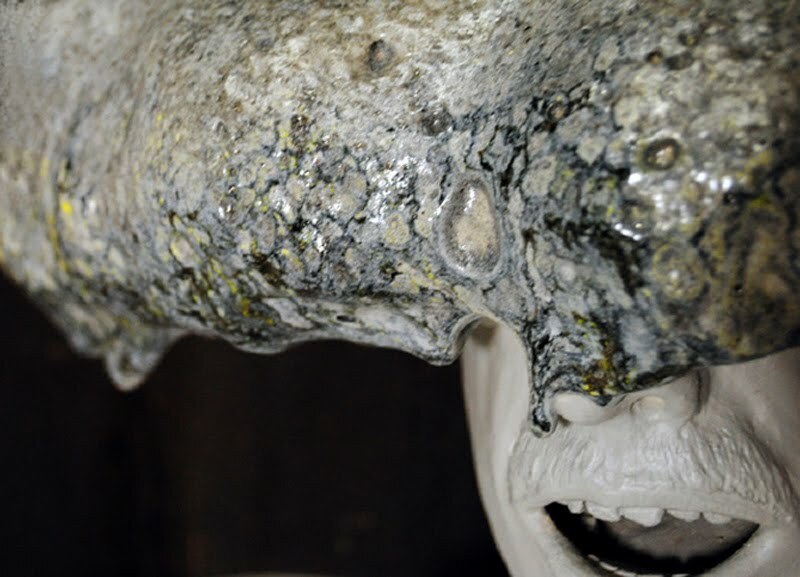 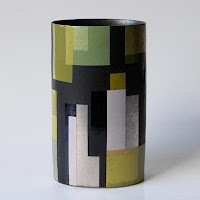 The application of layer by layer of the coloured transfers, gold and silver nuance the ceramic glazes, changed by the firing, melted and mixed, - hiding or partially covering the under-laying colours. 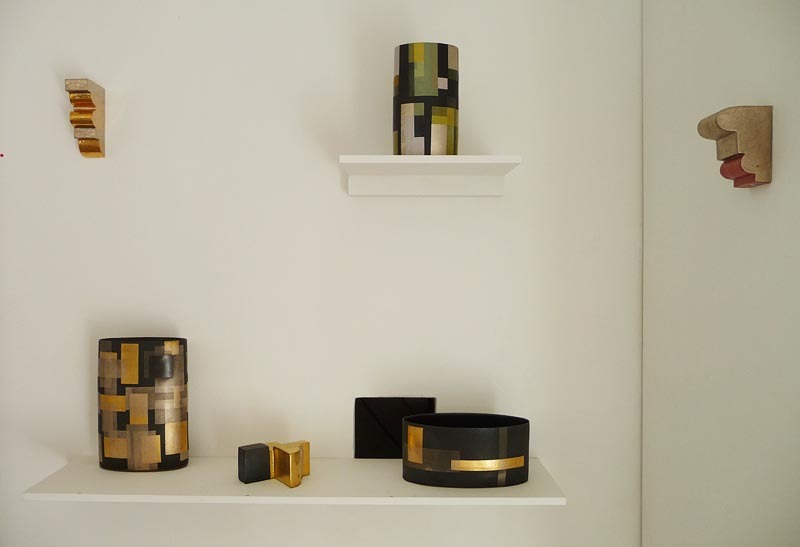 The motives have appeared in a thoughtfully reflective working process and relate in the geometric language of form to Bauhaus, Avant-garde, architecture, collage and Japanese textile. ”A small book from the Mediterranean Museum in Stockholm: Hemliga i Förvandlingar = Secret in the Transformation is about the eternal transformation of the Egyptian Gods. 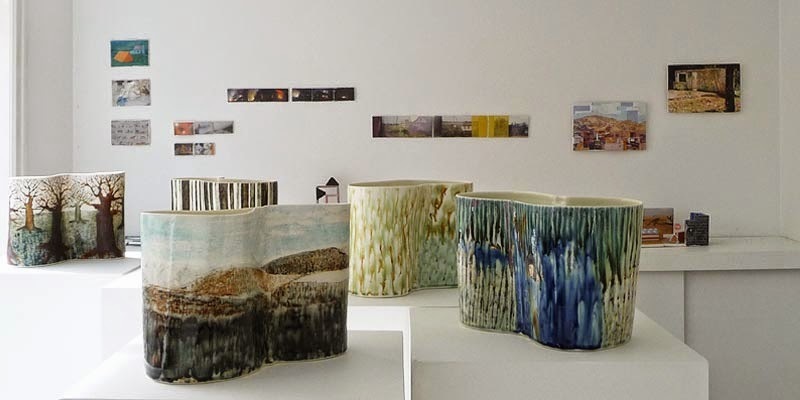 The decorations on my simple vessels, made for this exhibition, consist of transfers often in many layers and fired numerous times. Every time, the colours transform rather unpredictably even at low firing temperature. 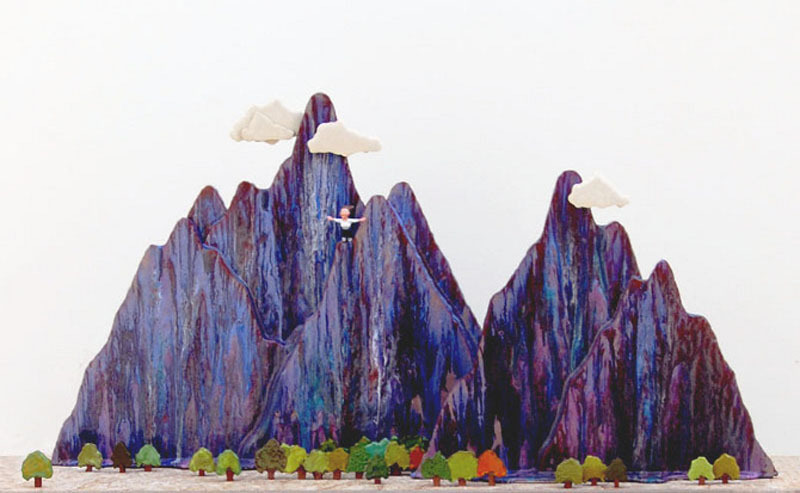 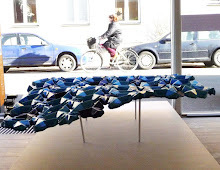 Each layer adds a new paragraph, a new chapter, a new layer to the tale – for ever changing. 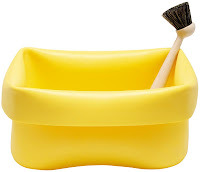 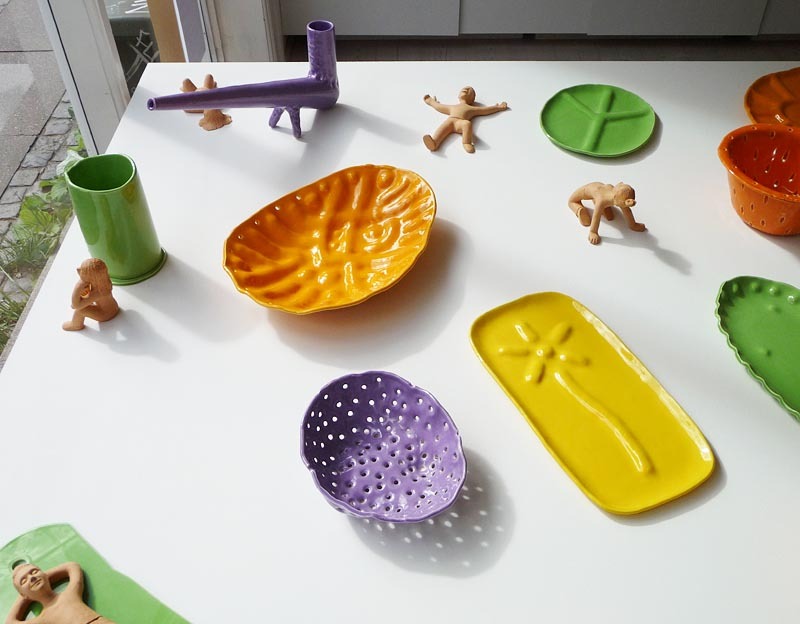 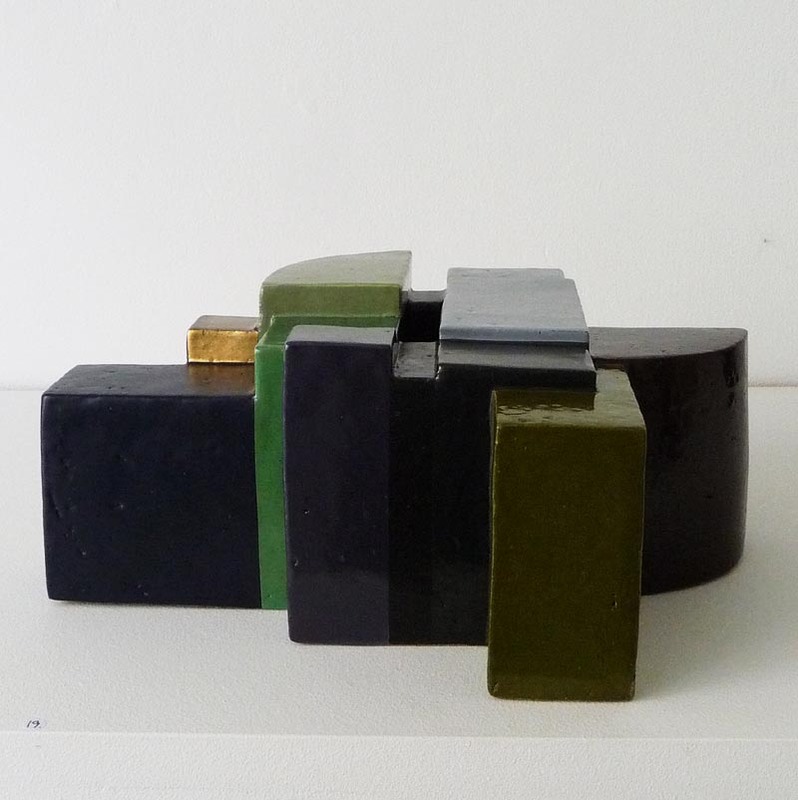 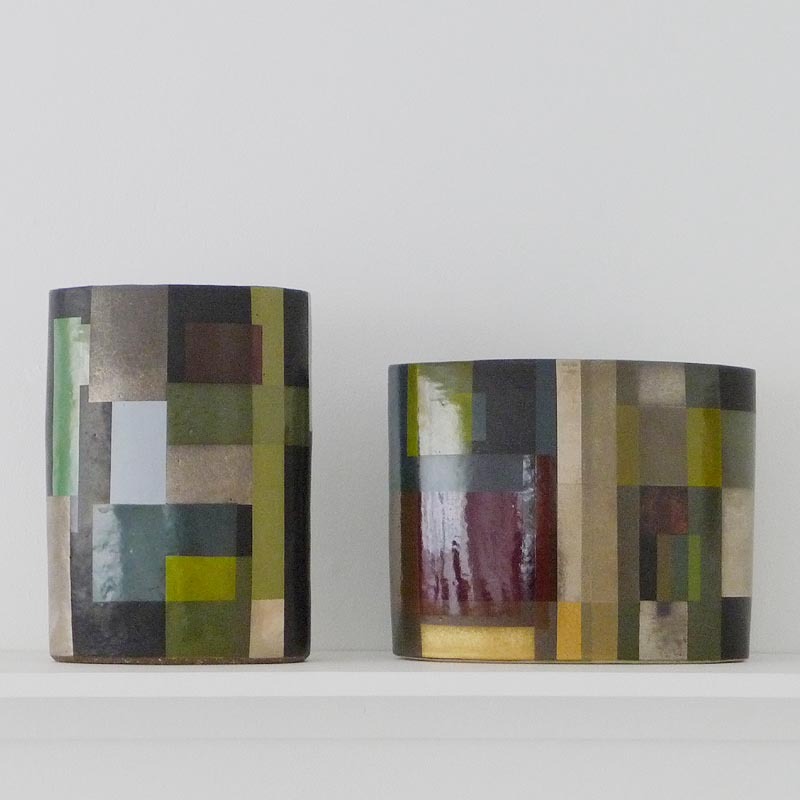 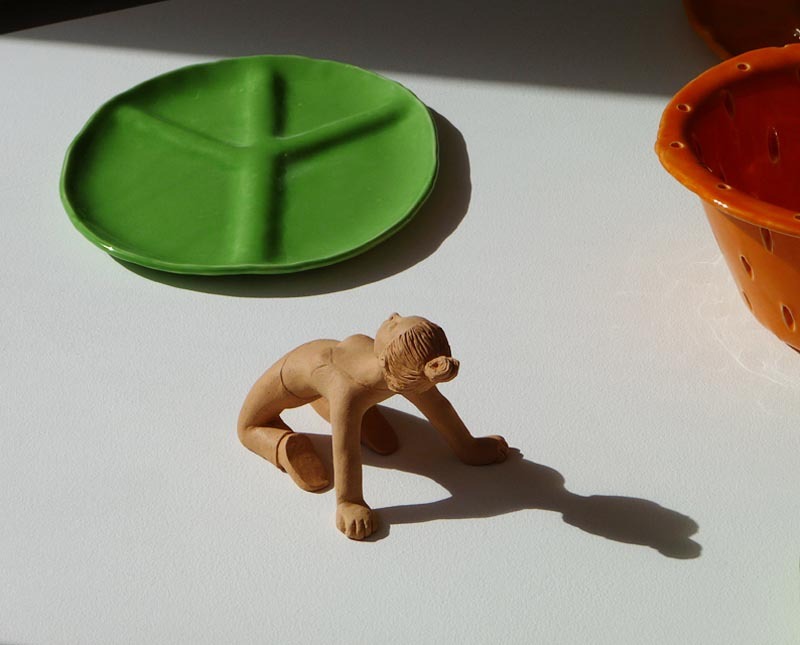 Transfer colour – this specific technique of applying ceramic colours to stoneware and porcelain, came to my hands for the first time at the Danish ceramic factory: Bing & Grøndahl in the end of the sixties. 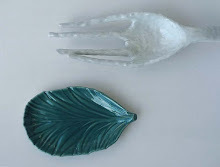 Since then I worked with decoration, where I covered one layer of clay slip after the other with fluent latex. 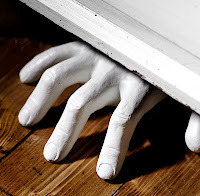 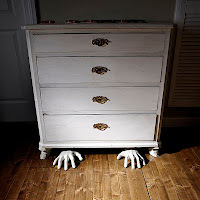 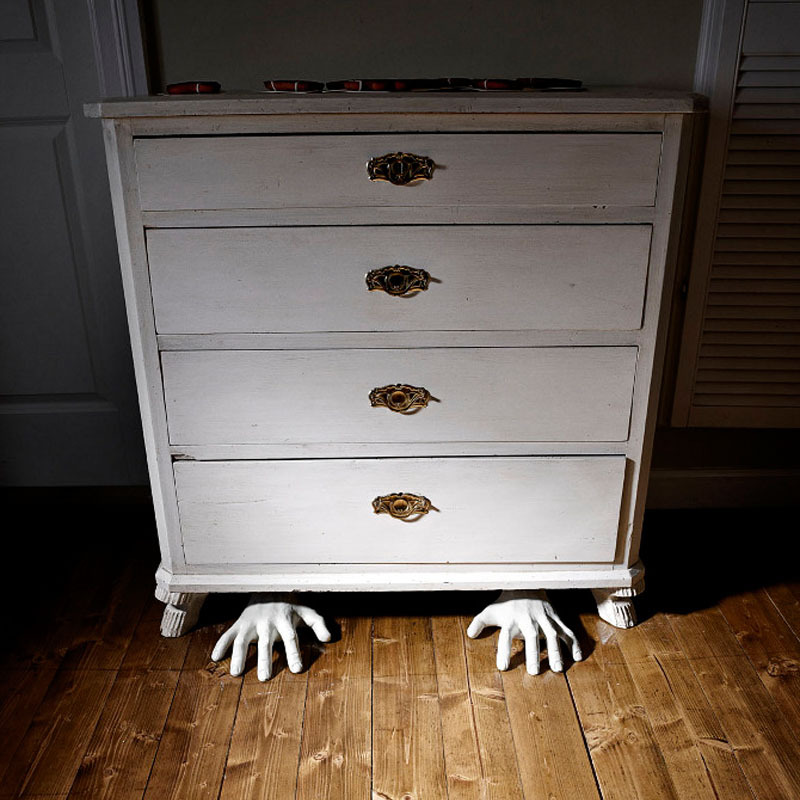 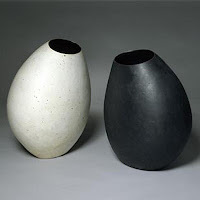 Then came a time period with amorphous forms, that did not call for any kind of decoration. Until not long ago by accident in Holland, I once again touched a sheet of coloured transfers. 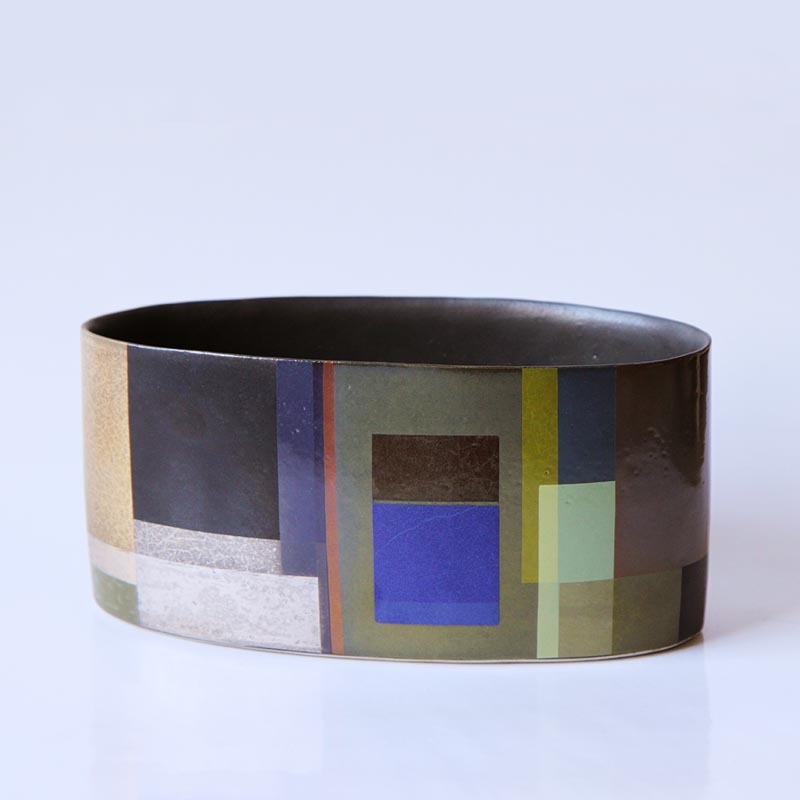 The results are kaleidoscopic with memories of Bauhaus, Avant-garde from Russia and much more. 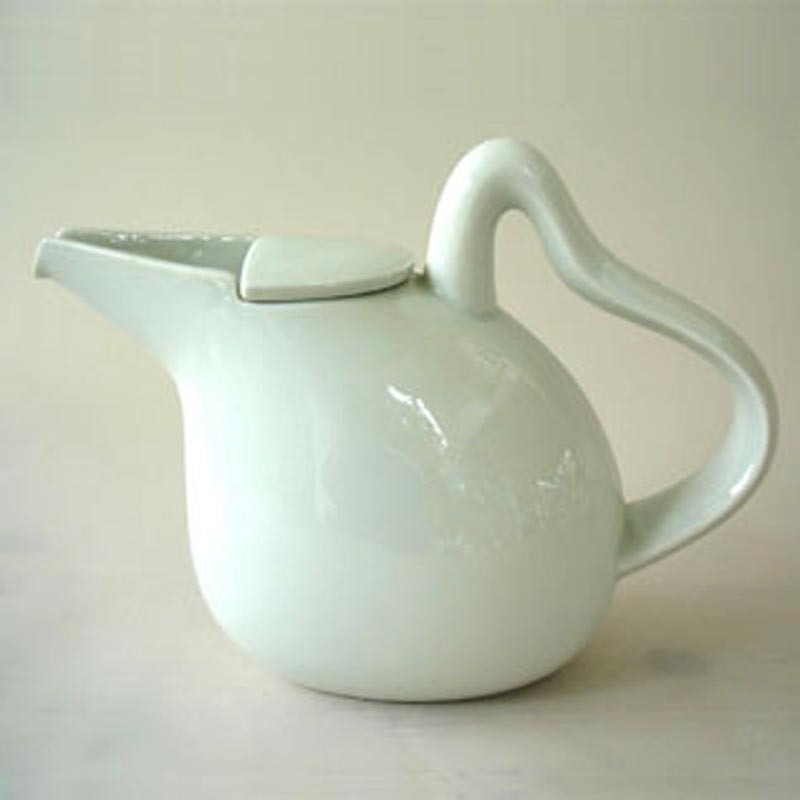 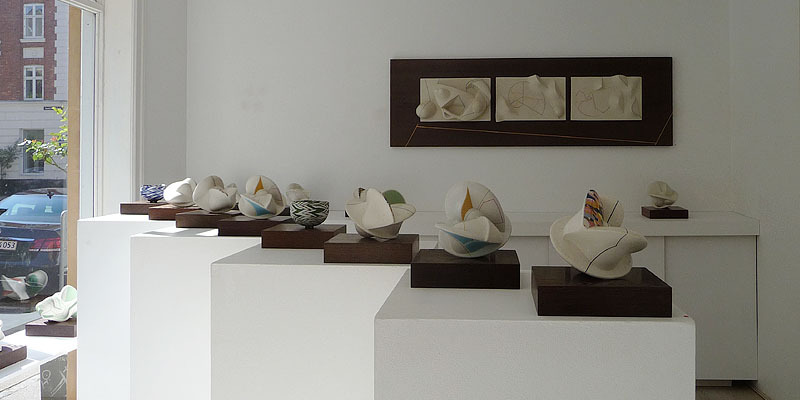 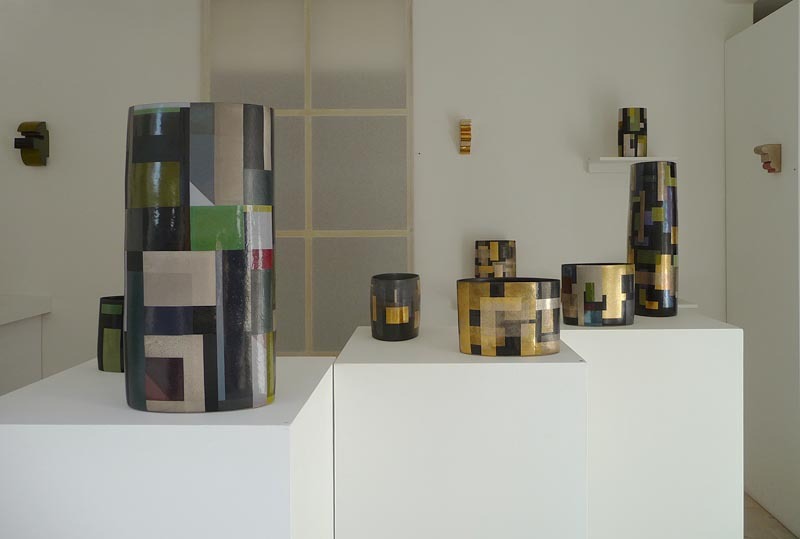 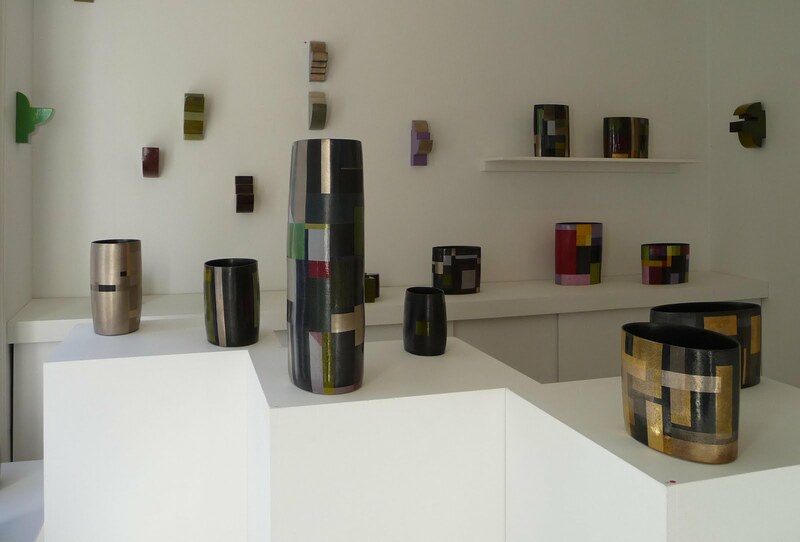 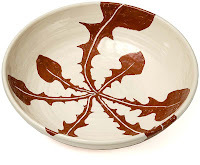 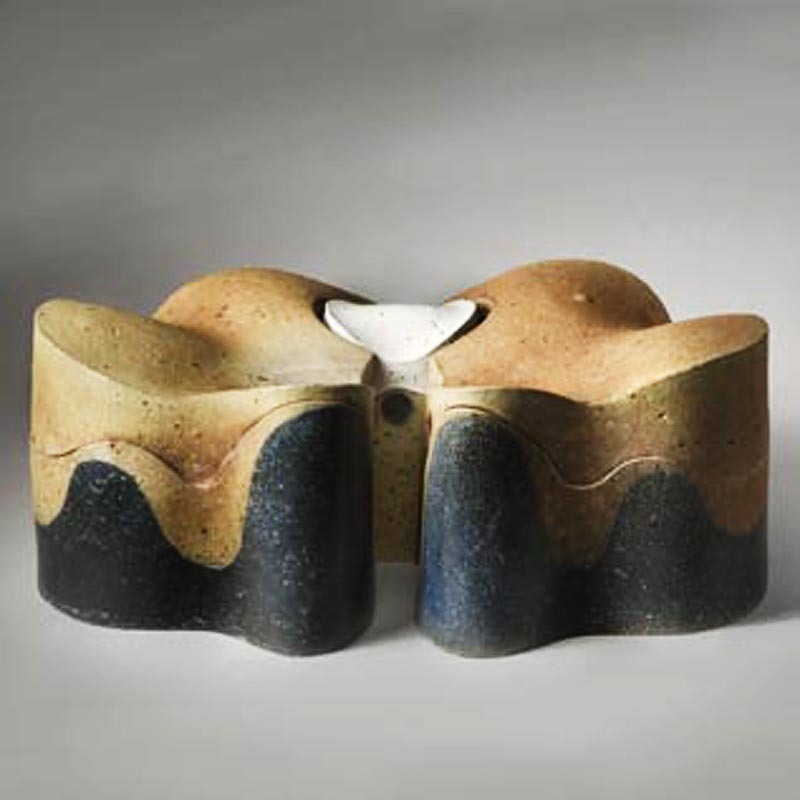 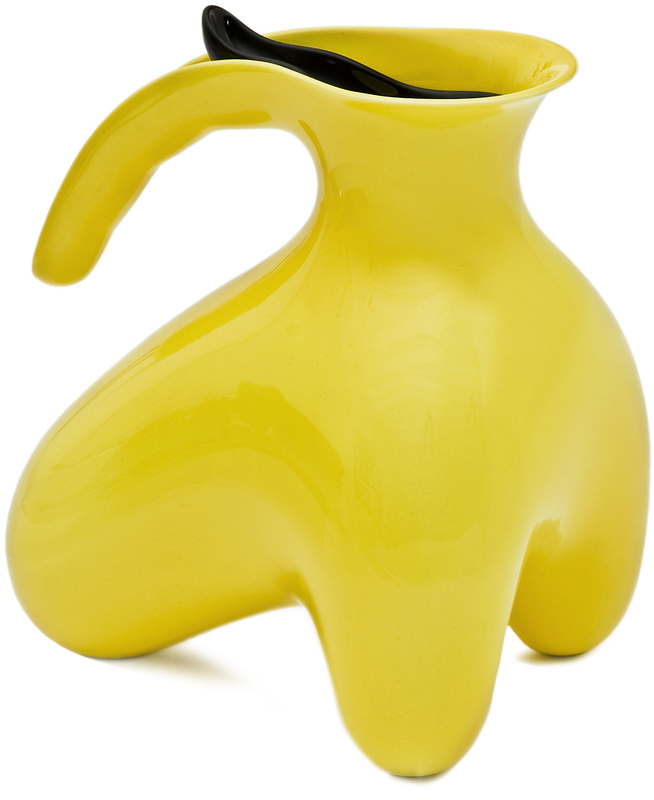 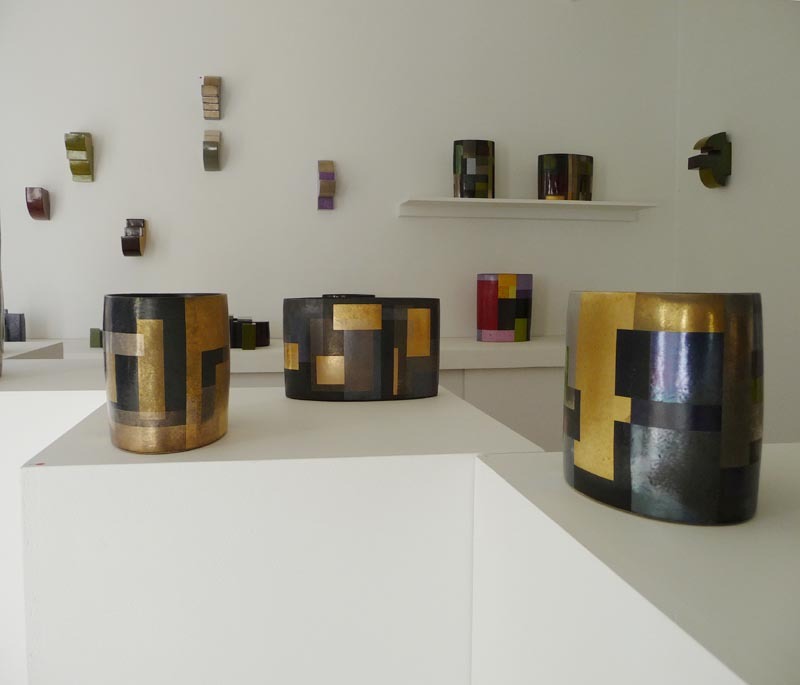 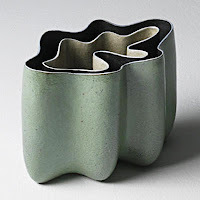 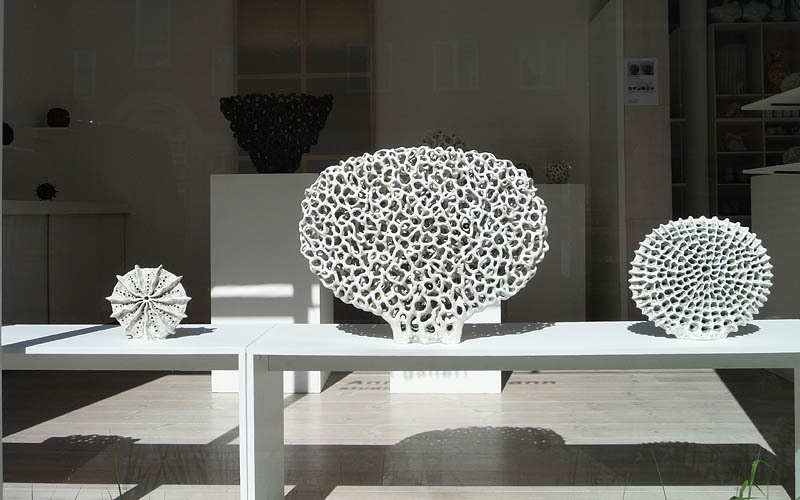 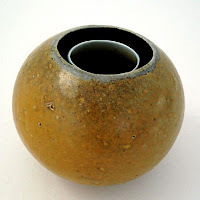 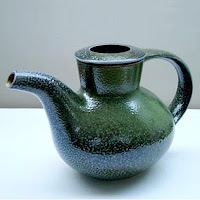 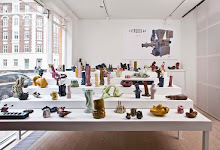 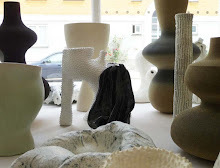 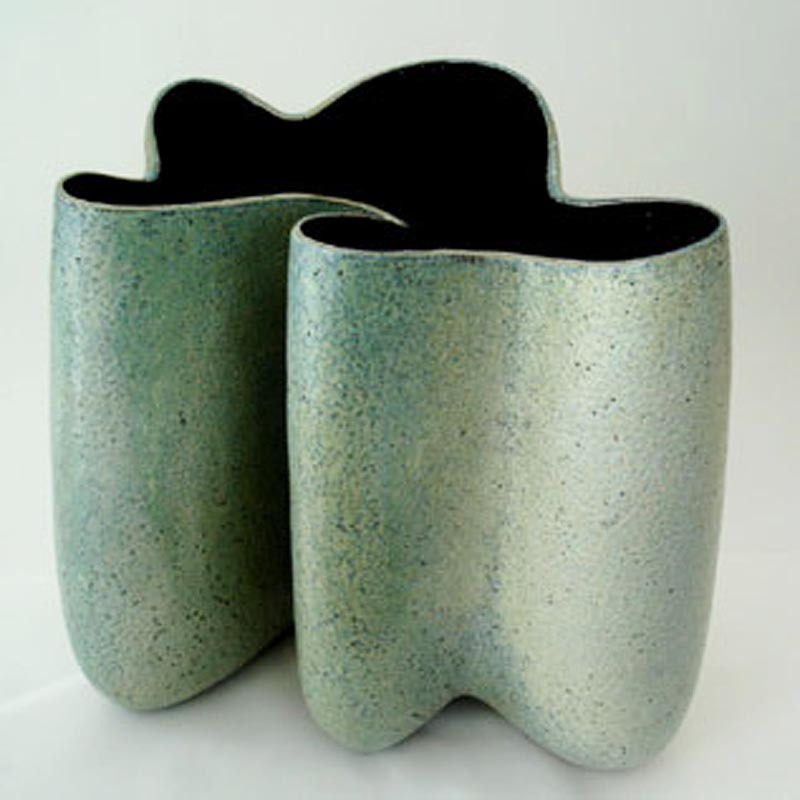 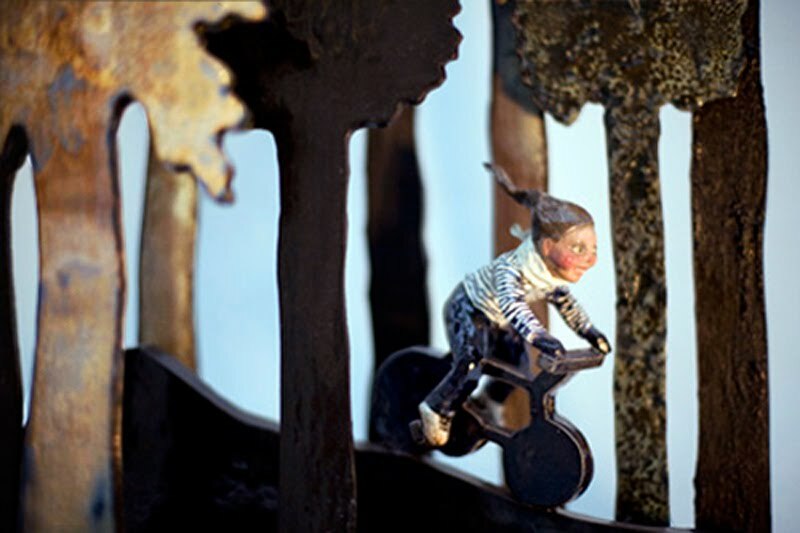 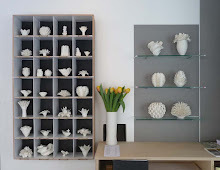 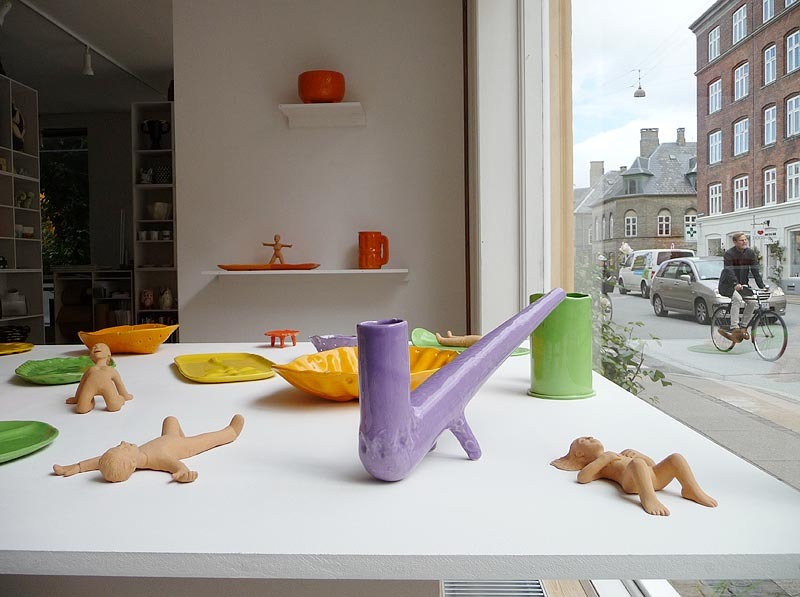 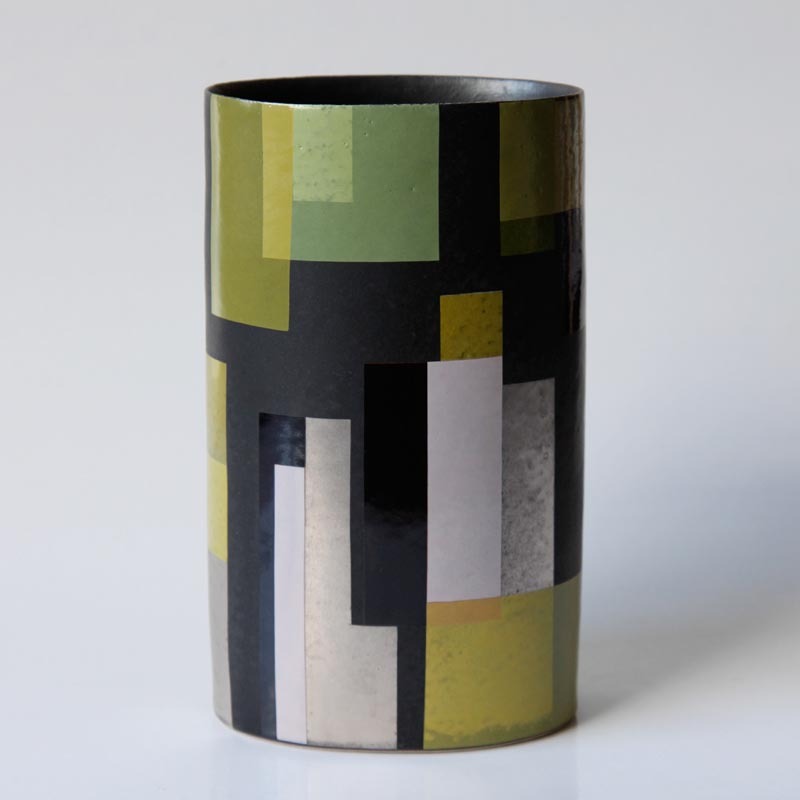 Bente Hansen has in her long career been especially active and engaged in Danish ceramics and design. 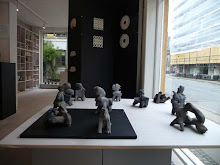 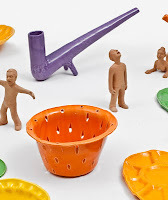 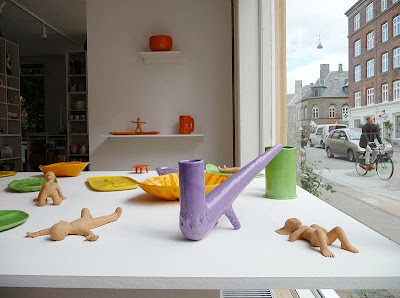 She was affiliated with the Danish ceramic factories Bing & Grøndahl 1964-1970 and Royal Copenhagen 1976-1980, leader of the ceramic department of the Danish Design school (now: The Royal Danish Art Academy - Design School) 1992-97, and has had her own studio since 1966. 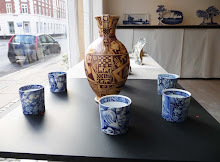 The first 41 years in the middle of Copenhagen, Brolæggerstræde. 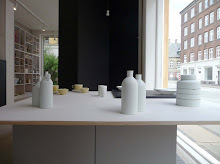 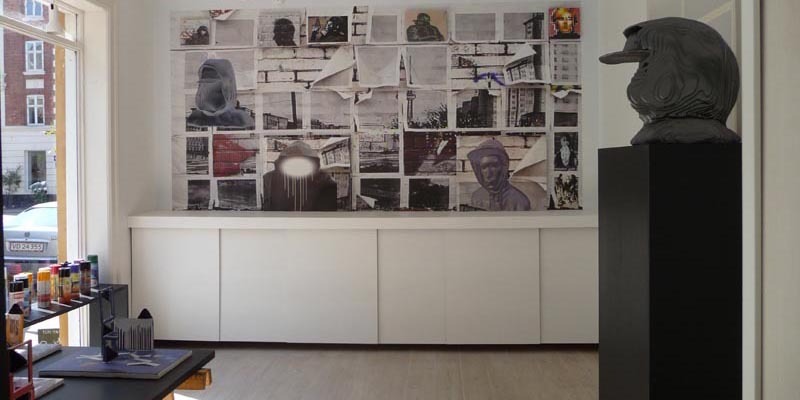 Married to the Danish designer Ole Palsby she had her studio in Aalsgaarde (village north of Copenhagen), - and in 2012 she has established a new studio in Sturlasgade, Amager - Copenhagen. 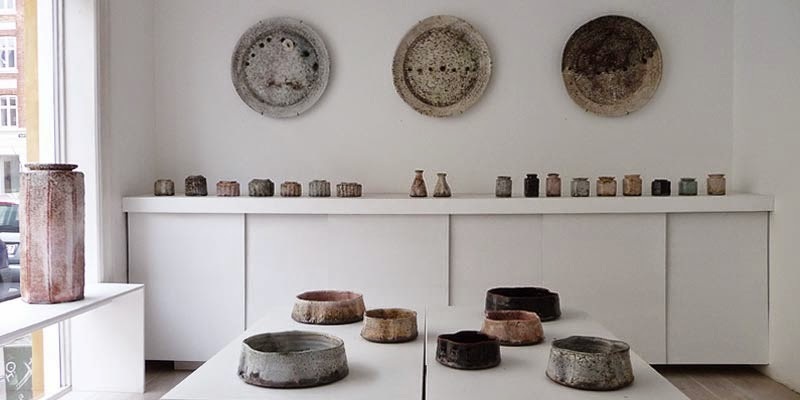 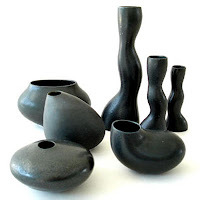 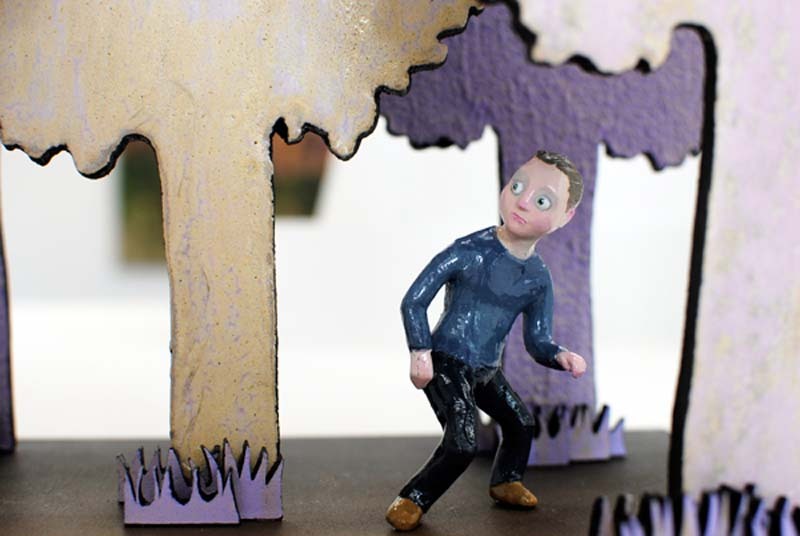 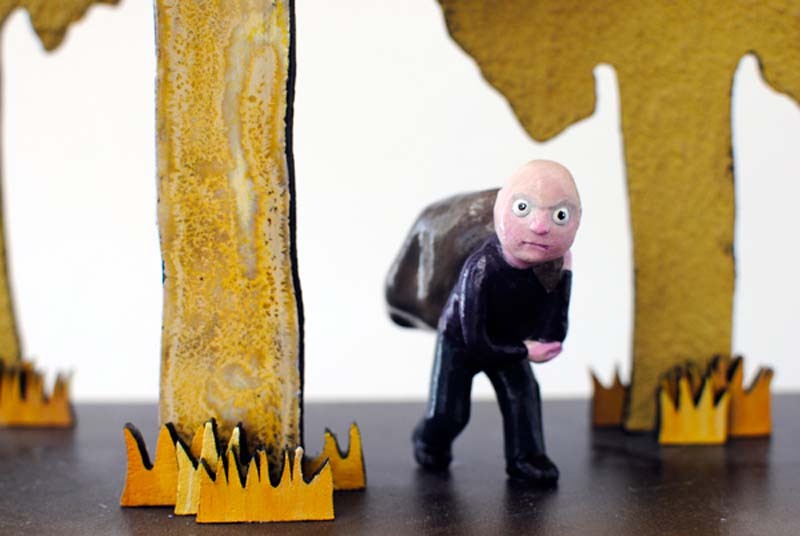 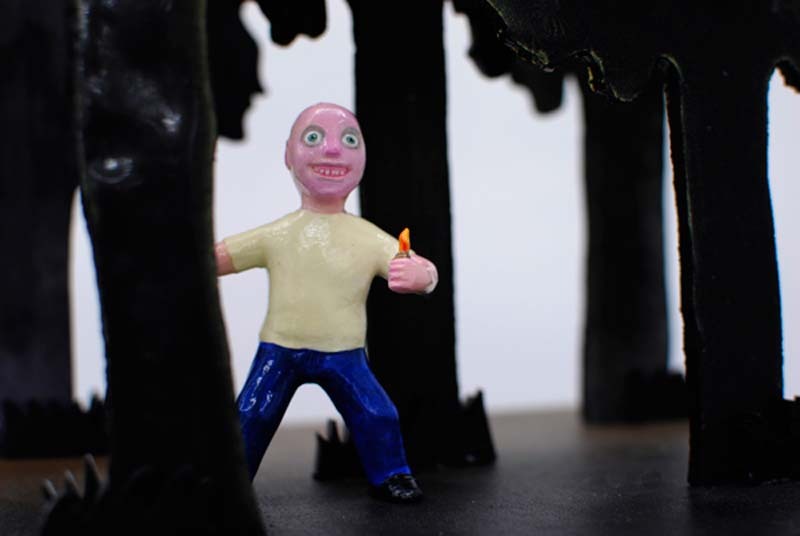 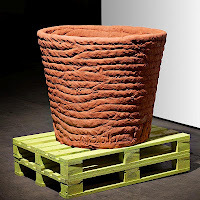 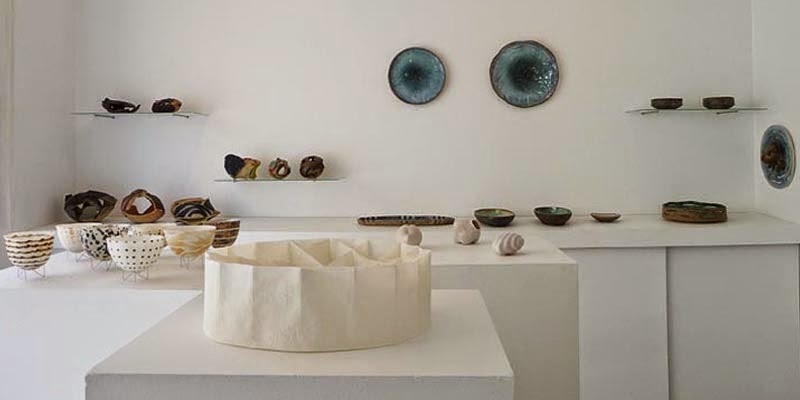 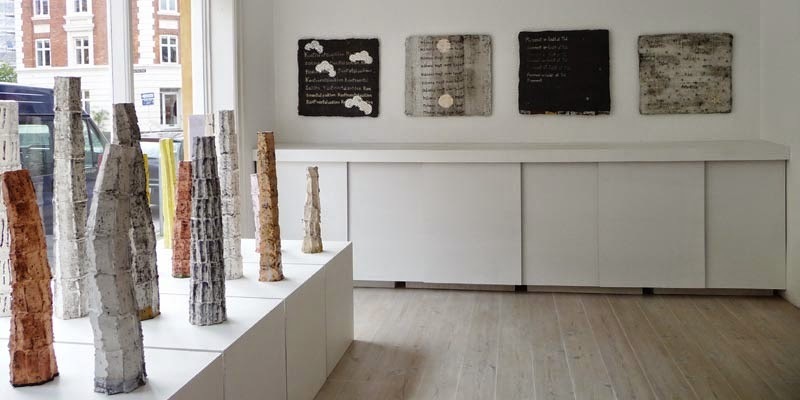 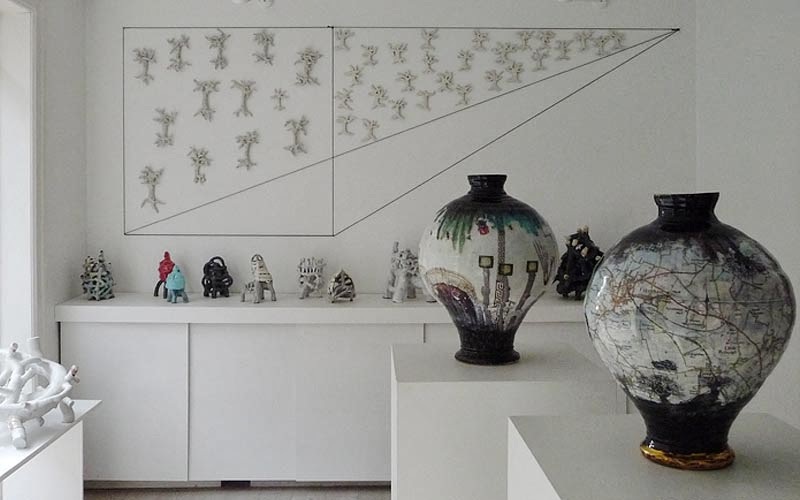 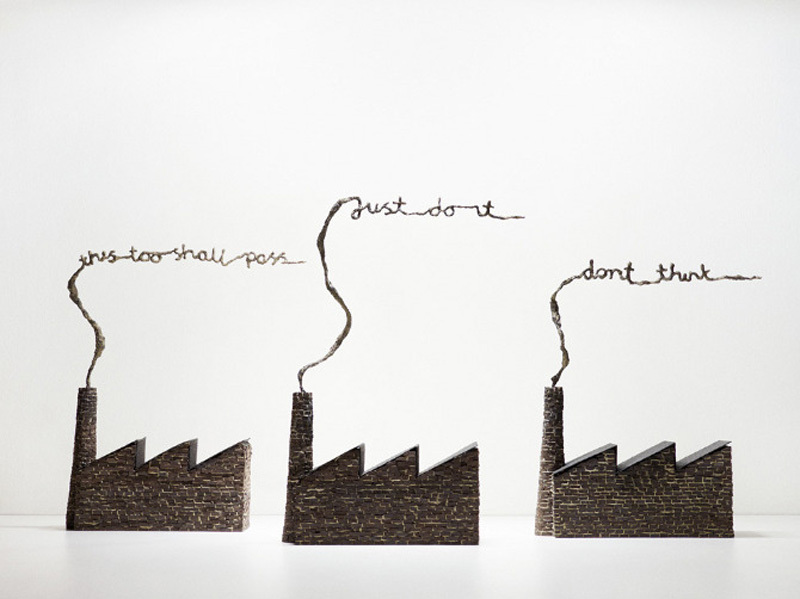 Bente Hansen is a member of the Danish associations 'Corner' and 'Keramiske Veje', and IAC International Academy of Ceramics... She exhibits internationally and has received several Danish and international Awards.